Many of our Climbers choose to fundraise, but it is not a requirement. However, for those choosing to raise money, you can be confident that all of the funds go to support and develop deserving projects and programs in communities around the world. Individuals, friends, or other sponsors who have a Climb event to raise awareness and support for perinatal mood disorders: 50% of money raised will go into the Perinatal Action Fund and 50% will go to PSI to support their many programs that help families and educate providers around the world. The Perinatal Action Fund was created by the transfer of funds after the closure of Postpartum Progress, Inc. The Perinatal Action Fund was developed to provide funds for underserved populations within the perinatal mood disorder community. 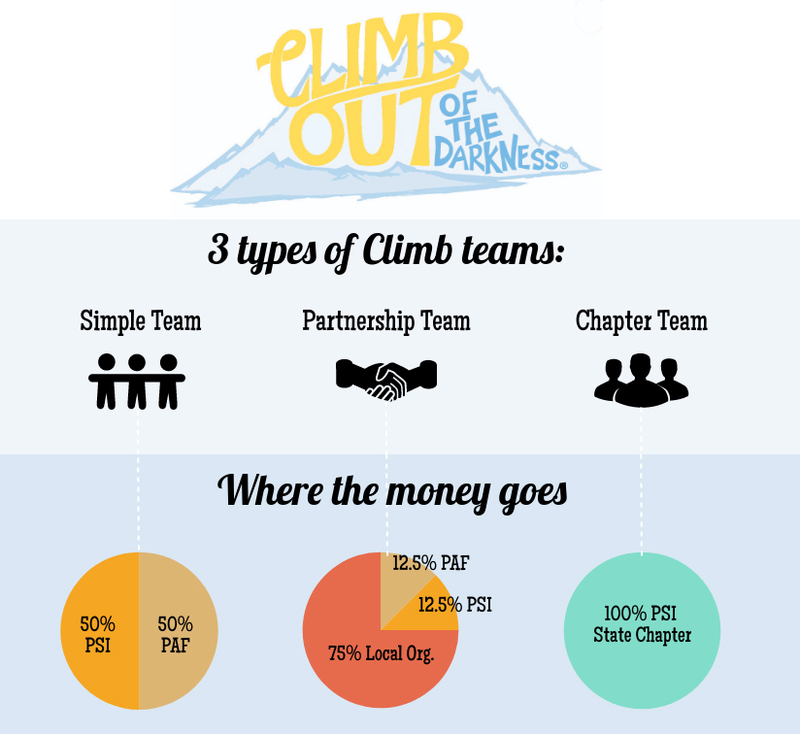 Organizations or groups that organize a local Climb with their members: You will receive 75% (after administration fees) of the money they raise for an approved project involving perinatal mood disorders. The group will have a chance to register after they organize a Climb event, and there is no requirement that they have a 501c3 organization. Money will be sent to the group within 8 weeks of the close of the Climb. The additional 25% (after administration fees) will be placed into the Perinatal Action Fund developed to provide funds for underserved populations within the perinatal mood disorder community. PSI chapters: Climbs organized by a PSI State Chapter will have all of their Climb funds returned to their individual state chapter account, minus admin fees. These funds from the Chapter-organized climb will be included in the accounting of regular Chapter fees at year end. Write to chapters@postpartum.net for more information about PSI Chapters. You’ll find your PSI Chapters here. Every dollar helps, and we appreciate the fundraising and awareness-raising efforts made by all! Every Climber who raises $100 receives a free t-shirt.